The sand on South Walton’s beaches is extremely fine. This is from the long journey the sand went through to reach its destination. The sand along SoWal beaches was once part of the southern Appalachian Mountains. Over millions of years, as the mountains weathered, particles of quartz were washed into riverbeds and transported by river to the ocean. The flow and ebb of the water over this long distance broke down the particles and buffed the edges making them as fine as sugar when they finally rested along the shore in our area. The Gulf of Mexico along the beaches of Destin & SoWal is so clear because no large, sediment-heavy rivers directly influence the waters. The water coming out of the Apalachicola River, the primary source of our Gulf water, is filtered through the estuary of Apalachicola Bay. While passing through this bay and out past the barrier islands in that area, the Gulf water deposits most of the silt and other sediments, that for example, make the Atlantic less translucent. The Gulf water along the beaches of Destin & SoWal appears aqua green because of the purity and hence crystal clarity of the water. The shallowness of the Gulf and the high reflectivity of light off our sugar-white sands also help to create our beautiful translucent water. Fine as sugar, white as snow, green as emerald and blue as aquamarine. These phrases are often used to describe the sand and water along our shoreline. This shoreline consists of pristine dunes, wildlife and vegetation not found in many of today’s coastal environments. In addition to the sugar-white sand, aqua waters and unspoiled sand dunes, you will find beautiful nature trails and a safe, crowd free environment. Approximately 40% of the acreage that makes up SoWal is owned by the state and is thus protected from future development. Birmingham magazine recognized ArtsQuest as the “Best Arts Festival” and the magazine also gave Sandestin Golf & Beach Resort the distinction of the “Best Family-Friendly Destination.” In 2002, Florida Trend magazine gave the Golden Spoon Award to Criolla’s restaurant for the 14th consecutive year. Florida Trend also recognized the Sandestin Hilton’s Seagar’s restaurant as one of the top 200 new restaurants in the state. State parks and miles of nature trails are perfect for those who prefer hiking and biking over swimming and sunbathing. Dunes, pine flatwoods and salt marshes provide a safe haven for an abundance of plants, birds and other wildlife, including several endangered and threatened species. Nature trails at Grayton Beach State Park, Topsail Hill State Preserve, Point Washington State Forest and Cassine Gardens offer wonderful opportunities to observe flora and fauna. SoWal is home to 17 fresh and saltwater lakes as well as the Choctawhatchee Bay. These waters are a haven for fishermen and kayakers. Read more about Grayton Beach Ecotourism. When you hear the word “beach” you think of summer. And, naturally, summer is the peak season along Destin & SoWal. However, fall and winter are quickly becoming popular due to the many “perks” this time of year offers. Rates drop, sunsets are spectacular, temperatures are mild, crowds are few, and festivals are plentiful. Destin & SoWal offer championship golf concentrated along a 12-mile stretch of the Gulf of Mexico, including Sandestin’s Burnt Pine Golf Club, Links, and Baytowne — all named as Golf Digest’s “Best Places to Play.” Sandestin opened its fourth course, The Raven Golf Course, in 2000 and it has already been voted best new course in the state. Tennis is also a popular sport with hundreds of courts open to the public. Whether you are a tennis pro or just learning the game, you’ll find all levels of play available on hard, clay, and even the only Wimbledon-style grass courts in North Florida. 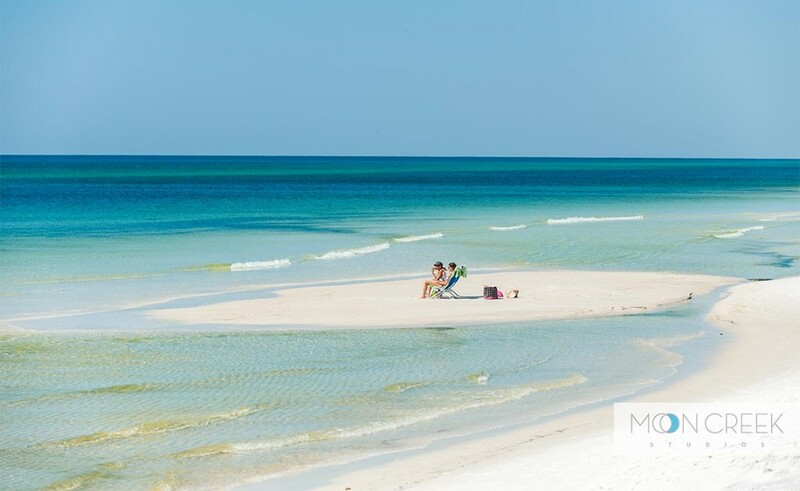 It wouldn’t be the beach without water sports and visitors to Destin & SoWal can find plenty of ways to “get their feet wet.” Home to the Gulf of Mexico, 17 fresh and saltwater lakes, and the Choctawhatchee Bay, visitors can enjoy fishing, boating, kayaking, snorkeling, scuba diving and, of course, sunbathing. Shopping and dining have become art forms in Destin & SoWal. You will find everything from quaint antique shops along the South Walton Antique Trail to the largest designer factory outlet center in the nation. You won’t want to miss Seaside’s open-air market and artists colony or the many shops that are part of The Market at Sandestin. Art galleries are also plentiful throughout the area. After a day of shopping, nothing is better than a great meal. Destin & SoWal are home to over one hundred restaurants offering everything from fresh Gulf seafood to Caribbean Creole cuisine. (And since you’re in the south, you can also expect to eat some of the best Southern-style cooking you have ever had.) Seven of Florida Trends’ top 200 restaurants in the state are located in SoWal including Bud & Alley’s, Café Thirty-A, Seagar’s, Elephant Walk, and Sandor’s. We are also proud to be the home of Criolla’s, voted one of the top 400 restaurants in the world by Wine Spectator. SoWal offers visitors the opportunity to explore turn-of-thecentury Florida Panhandle architecture amidst the beautiful grounds of Eden State Gardens and the Wesley Mansion in Point Washington — one of the first towns established in the area. Visitors can also tour the 100-year-old community of Grayton Beach characterized by wooden houses made of weathered cypress and bordered by sand streets and an abundance of trees. The natives are friendly so make yourself at home. Read about Grayton Beach history.